Pilots are used to valide the methodology and to demonstrate the use of its approach through the development of real robot applications targeted at real customers, to illustrate vendor-neutral and environment-neutral composition of systems. Pilots span different domains and different kind of applications and requirements – centered around navigation and (mobile) manipulation. This is a mobile goods transport scenario, such as factory intra-logistics. Key performance areas will be i) performance of goods delivery and ii) ease of integration, not just between the robotics systems themselves but also with the other IT systems in factories and companies. To make a complex multi-arm application with arms from two or more different robot vendors, e.g. 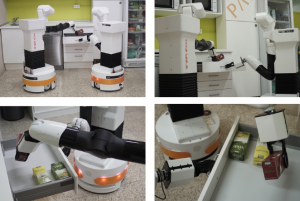 manipulation tasks, comparable to how two humans would share a task of moving boxes. This Pilot has several similar technology components as the first pilots, but environment and task requirements are very different. 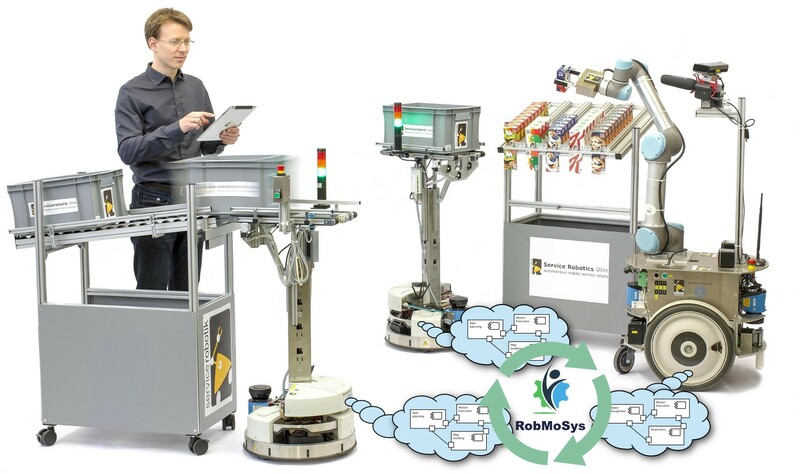 The RobMoSys Consortium has the luxury of being able to offer the services and equipment of the Robotics Innovation Facilities (RIF Paris-Saclay, CEA) and Centres of Competence (CoC in Munich, TUM). They provide assistance, support and advice in robotics to a varied pool of stakeholders, ranging from pre-start-up up to mature businesses. RIFs and CoCs provide expertise and equipment to favour new usage and assist new users in innovation in robotics. CoC are focused on manufacturing applications and RIF are multi domains (healthcare, transport, manufacturing, security, etc.). The pilots can be provided to project contributors to support designing, developing, testing, benchmarking and demonstrating their contribution. The realisation of the project’s developments are not limited to the RobMoSys pilots, but can be created anywhere in the community. The core partners will be in charge of preparing shared system models and software components and developing of skeleton applications for the pilots. document the integration process as a template for next-generation service robotics system integrators. At the end, all concrete models and software components will be documented and made available in a public repository. RobMoSys receives funding from the European Horizon 2020 research and innovation programme under grant agreement No 732410. The content of this website reflects the views only of the author, and the Commission cannot be held responsible for any use which may be made of the information contained therein.